It’s time to take a look at the 2 chapter oneshot sequel to Kenshin that came out. This serves as a set up to the ongoing sequel coming out so you definitely want to check it out to stay current. It’s a pretty fun series and the two chapters really go by quickly. It starts off with two prisoners being released. One guy is named Ashitaro and he was arrested for dining and dashing. The other guy is Aran and I forgot exactly why he was arrested but they got him for years. A mysterious girl shows up when they are released and claims that Ashitaro has her treasure. They used to both work for the same villain organization but Ashitaro ran off. He claims not to know anything, but it could be the sword that he buried a while back. Aran decides to help Ashitaro out in retrieving the sword and living a normal life after prison, but are these two fighters strong enough to take on a villain organization? Since Ashitaro is the lead here and will likely have a big role in the actual series, it is imperative that he is a likable character. I think he’s pretty good at any rate. He reminds me of Tyson’s counter protagonist in the Beyblade manga. Ashitaro is a pretty good fighter but he’s also rather basic and doesn’t really think about anything. He just likes having a good fight and can dish it out with the rest of uis. Second to none is food for him though. He’ll eat anything and isn’t picky. He’s certainly no Kenshin, but he is the real deal when it comes to using a sword. I’ll definitely be glad to see him return. His partner Aran is a lot less impressive. For starters, Aran can’t even fight. That brings up a lot of red flags right from the start. I also can’t say I care too much about his half American heritage and hopefully it’s not a big plot line. I guess it could lead to something cool if it turns out that his American relatives want to take him back by force or he’s related to the villains but we don’t really need the human sidekick right now. He could certainly be much more annoying than he actually is though so I’ll stay content with that for now. The writing is sharp as always which really makes a difference for characters like this. There aren’t really any other big characters at the moment. I suspect that the girl may become a big character at some point, but we’ll see. The one shot villains here are fairly generic, but serve their roles well. I have to give some props to the first villain for still being able to talk even with a sword through his head. That guy definitely has nerves of steel. The other villain with the oil weapon was pretty strong as well, at least when put up against the main characters. I’m looking forward to seeing how much fun the real big villains are. If you were worried about not seeing Kenshin or the rest of the old cast, don’t worry about it. They show up briefly and Kenshin definitely has a great role. It’s nice to know how much time has passed since the end of the main series and it is mentioned here. It hasn’t been too long of a gap so fortunately everyone should still be able to fight at a high level. The ending shows us that the whole cast is getting ready to go to Hokkaido so that’s sure to be a pretty epic arc. I’m expecting a lot of big things there. The art is exceptional, but that almost goes without saying. I’ve really missed the Kenshin style. The action has a lot of depth and the speed lines really make it look extra impressive. The action scenes were great and as I mentioned the writing is pretty sharp. I can easily see the sequel being a top tier threat to all of the other manga titles once it actually comes out or is scanned. While Ashitaro’s sword is cool, I think he’s going to need another one almost immediately. In the story it is bent out of shape and badly burned so unless he makes this some really unique combo starter where the shape actually helps him, I can’t see the big villains being very threatened by the kid. I could also see him getting it repaired and if so, Kenshin’s master needs to appear. He never got much closure so this could definitely help. I wouldn’t mind if the sequel also has a brief timeskip so that we can gloss over that part and also have Aran learn some fighting off screen. Then the series will be set. Overall, I’d definitely recommend checking this one out. After all these years, we finally have Kenshin back in business. Hopefully the series really lasts for a long while and that it doesn’t jump the shark. Sequels don’t always have the best of reps, but I think this one is going to be one of the best sequels on the block. Hopefully these chapters come out with volume one once the series is licensed so fans don’t have to try and track these chapters down. How I see it, the set up/prequel to the sequel should always be included. 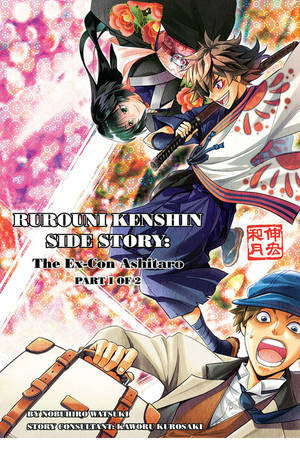 This entry was posted in Manga, Manga Reviews, Reviews and tagged Ashitaro, Manga, Manga Review, Review, Rurouni Kenshin, Sequel, Shounen, Side Story, Spinoff by dreager1. Bookmark the permalink. I have a lot of hope for this series. (And hope for a new anime as well!) The ending with Kenshin and Kaoru reminiscing was a nice way to hook readers. Can’t wait to see everyone again. Agreed, this series really has potential to be amazing. The original Kenshin is still one of my all time favorites to this day and this sequel is definitely getting some big build up with the whole cast returning.